Boys' neckties aren't a daily wear item for most boys, but these accessories come in handy for a variety of dressier occasions. While a tie might not be a requirement, parents sometimes want the special touch that a tie provides. Plus, boys love to look like their dads, so if dad is wearing a tie, his little boy will probably be happy to wear one as well. A tie can accompany a linen suit, but it can also be worn with just a nice pair of slacks and a long-sleeve dress shirt. This is a common question among parents. Should you buy a clip-on tie or a necktie that requires actual tying? The choice is really up to you and your personal preference. While clip-ons are much easier to place on a boy (especially if he's young, squirming and doesn't want to wear one in the first place), tie-on ties will give boys practice for when they're older and may have to wear a tie every day to work. Practicing with dad is also a good bonding activity a boy can enjoy. For boys who attend private schools, a tie may be a mandatory part of the uniform, in which case, a boy may as well learn how to tie one properly. If you know your son can keep still and not bother his tie so much, a tie-on may be fine. For very young boys, however, such as toddlers who have to dress up, a clip-on will probably be less frustrating for everyone. Be prepared, though, for a toddler who can pull his off. You can usually find boys' neckties where boys' accessories are sold, so look for them around the belts and/or the dress suit area. 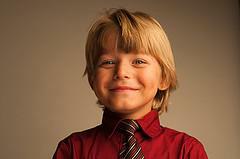 You won't find as large of a selection as you will in men's neckties because boys' neckties aren't worn as frequently. Some boys can go through most of their childhood with only one or two ties, so choose colors that are basic and that will accessorize with colors that he most often wears, such as blue. You'll find a basic selection in colors that boys can wear with the most typical color shirts and suits available for them. For a special occasion such as a First Communion, however, you'll be looking for a white tie. You will probably have to shop in your church's gift shop or buy from a parochial school store for this particular item. Each of these retailers feature plain, patterned and even wacky ties that boys may like. A boy may not mind having to get dressed up as much if he has his choice of necktie to wear. While a jungle print tie probably won't cut it as part of a school uniform, if a boy gets to wear a zany tie to a nice dinner, he may be more cooperative about tying one on. Whether a tie is a necessity or simply an extra accessory, boys' neckties can make even the most rambunctious boys appear to be little gentlemen, even if only for a few hours. Enjoy a wedding, party or other special occasion, and how grown-up they look while it lasts.